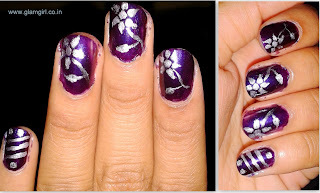 Recently I created this nail art and this very easy to achieve. You just need a base coat and silver nail paint. Here I am using Faces Plugged in 32 as base coat and with a brush give any shape or design that you like and you’re done, but don’t forget to apply the top coat to make it stay longer.